There’s something impossibly British about the color scheme of this lovely 1974 Norton Commando 850. I’m guessing it’s a Mark 2A model with the 828 cc engine—still an air-cooled twin like the iconic 750 models, but a little more relaxed in its power delivery. Today, the Mark 2A is one of the most desirable Nortons for collectors, and this one was spotted by Vermont-based photographer Matt Kiedaisch. 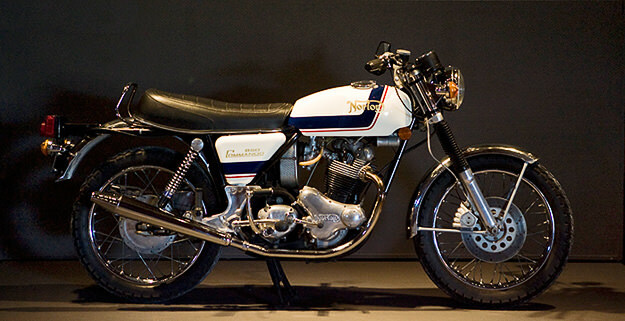 The bike was on show at the Shelburne Museum, as part of the “Full Throttle” motorcycle exhibition. It was supplied by local specialist Jack Manning of The Classic Bike Experience, “a bunch of guys who like to work on old British bikes (and yes, occasionally some other stuff)”. Their website is pleasantly ramshackle but curiously engaging, with some lovely old British iron up for sale.